I read a story today and just wanted to share it with everyone. I will not claim that this is my story and I am going to just copy what I have seen, but I think that as a Realtor in our small town of Idaho Falls even I can get caught up in the busy daily grind. Its stories like this one that sometimes help reel me back in and remember to slow down and look at what is in front of me. Be thankful for what I have and try to pay a little of that greatness back to whoever is willing to receive it. 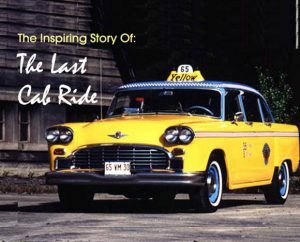 Some of you may have seen this on Facebook as I did but the story goes like this: (It was the last ride of this NYC cabbies shift…… and the last ride of this passenger’s life. He writes, I arrived at the address and honked the horn. After waiting a few minutes I honked the horn again. Since this was going to be my last ride of my shift I thought about just driving away. But instead I put the car in park and walked up to the door and knocked. “Just a minute,” answered a frail, elderly voice. I could hear something being dragged across the floor. After a long pause, the door opened as a small woman in her 90’s stood before me. By her side was a small suitcase. The apartment looked as if no one had lived in it for years. There were no clocks on the walls, no knickknacks or utensils on the counters. “Would you carry my bag out to the car?” she asked. I took the suitcase to the cab, and then returned to assist the woman. She took my arm and we walked slowly toward the curb. She kept thanking me for my kindness. “It’s nothing” I told her, “I just try to treat my passengers the way I would want my mother to be treated.” “Oh you’re such a good boy.” She said. When we got into the cab, she gave me an address and then asked, “Could you drive through downtown?” “It’s not the shortest way.” I answered quickly. “Oh. I don’t mind,” she said. “I’m in no hurry, I’m on my way to a hospice.” I looked in the rear-view mirror. Her eyes were glistening. “I don’t have any family left,” she continued in a soft voice. “The doctor says I don’t have very long.” I quietly reached over and snuff off the meter. “What route would you like me to take?” I asked. For the next 2 hours we drove around the city. She showed me the building where she had once worked as an elevator operator. We drove through the neighborhood where she and her husband had lived when they were newlyweds. She had me pull up in front of a furniture warehouse that had once been a ballroom where she had gone dancing as a girl. Sometimes, shed ask me to slow in front of a particular building or corner and would sit staring into the darkness, saying nothing. As the first hint of sun was creasing the horizon, she suddenly said, “I’m tired. Let’s go now.” We drove in silence to the address she had given me; it was a low building, like a small convalescent home, with a driveway that passed under a portico. Two orderlies came out to the cab as soon as we pulled up. They were solicitous and intent, watching her every move. They must have been expecting her. They opened the trunk and took the small suitcase to the door. The woman was already seated in a wheelchair. “How much do I owe you?” She asked, reaching into her purse. “Nothing.” I said. “You have to make a living,” she insisted. “There are other passengers,” I responded. Almost without thinking I bent and gave her a hug. She held onto me tightly. “you gave an old woman a little moment of joy,” she said. “Thank you.” I squeezed her hand, and then walked into the dim morning light. Behind me, a door shut. I couldn’t help but think that was the sound of the closing of a life. I didn’t pick up any more passengers that shift. I drove aimlessly lost in thought. For the rest of that day, I could hardly talk. We’re conditioned to think that our lives revolve around great moments. But great moments often catch us unaware, beautifully wrapped in what others may consider a small one. So do all you can to stay present within as many of life’s little moments as possible. You never know when your next one will be great.) Author Unknown. It is the week of thanksgiving, be thankful . Be thankful for everything you can see. Our whole life is made up of thousands of little moments that we pay little attention to. We focus on the giant moments that in the end mean little. Its like buying a house. There is a huge build up to finding the perfect home. Why is it that the focus, the stone bricks and wood stick frame walls. The focus should be on what is going to happen within those walls. When in all reality the whole process of buying and selling houses is not that big. Just because it has a big price tag shouldn’t be the reason it becomes one of the biggest moments. That is why I am in Real Estate, to help people find the place where they will make thousands of small moments. I would challenge anyone who reads this to look across the thanksgiving dinner table at your families in the next few days and consider the fact that that right then is in fact a big moment. Not everyone gets to have those moments. Some don’t have homes to have Thanksgiving. Some don’t have the food for that dinner and some will look across that thanksgiving dinner table at an empty chair that was only one short year ago where grandma sat. But is now the old lady that took her last cab ride. Hold your loved ones tight; be thankful that you have them.